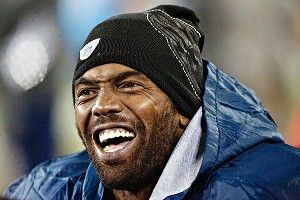 » ‘That’s My MO, Bro’: Randy Moss Is Back! ‘That’s My MO, Bro’: Randy Moss Is Back! The twilight of Randy Moss’ career, including a bizarre, sad exit from New England, a catastrophe of a stop in Minnesota, and an X-Files episode of a stint in Tennessee, came to a close in August when the wide receiver retired from football. Now it’s open again, as Moss has announced via UStream that he will be returning to pro football. During an informal broadcast on the site, in celebration of his 35th birthday, Moss said he had retired due to off-field family issues, which have now been addressed. Hence his imminent return to football. This is not exactly a shock. The biggest issue facing Moss never really seemed to be his ability to play football but rather his ability to be on a football team, be coached, and be a teammate. There are already rumors that Moss could rejoin the Patriots, a franchise that he holds in special regard. Even though his stint with the Vikings went down about as well as a forest fire, you can safely assume that he will have suitors. This is still Randy Moss we’re talking about. He’s the greatest downfield threat in the history of the game. What’s really important — and what we really should all focus on — isn’t so much Moss’ return, or the speculation on where he will land. No, we should be talking about fishing. Far more entertaining than his un-retirement announcement is the video posted below, in which Moss talks about a fishing trip he took with bass master Jeremy Starks, his best friend Drake, and some dude named Blue. It involved them driving all night, on three (or four!) hours of sleep, “no coffee, no meds.” Also? They hit a skunk. When I was watching this video, my girlfriend said from the other room, “I thought you already watched Justified.” That pretty much sums it all up, doesn’t it? Is the ACC the Most Exciting Conference in Basketball?